Background and objectives: The purpose was to evaluate changes in the left ventricular mass index (LVMi) among anemic chronic kidney disease (CKD) and end-stage renal disease (ESRD) patients treated with recombinant human erythropoietin (EPO). 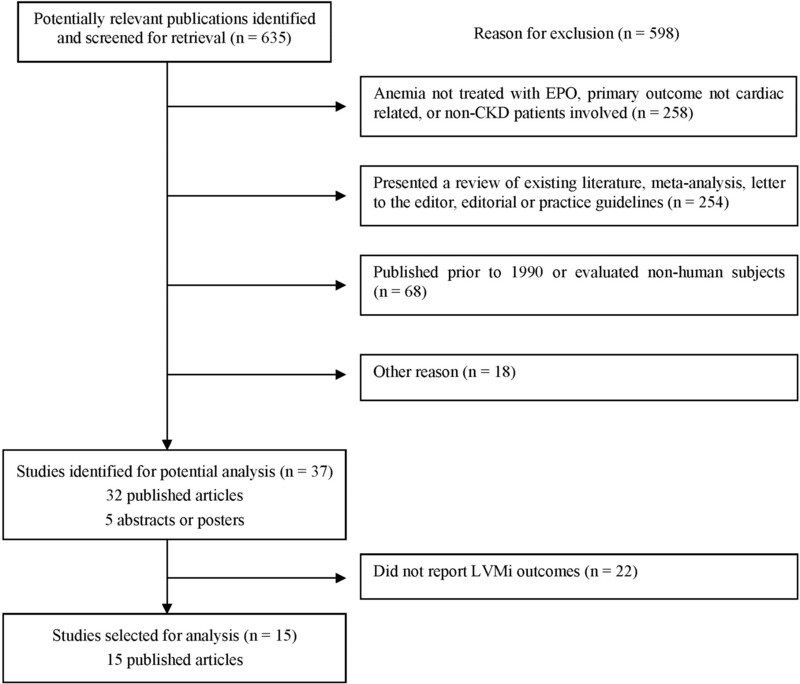 Design, setting, participants, & measurements: A systematic review of the literature, reporting LVMi for patients before and after EPO therapy, was performed. The change in LVMi from baseline to the end of treatment was calculated and stratified by severity of anemia at baseline, target hemoglobin (Hb), and stage of kidney disease. Results: Fifteen eligible studies involving 1731 patients were identified. Cohorts with severe anemia at baseline (<10 g/dl), when given EPO using a lower target level (Hb ≤ 12 g/dl or Hct ≤ 36%) experienced significant reductions in LVMi (−32.7 g/m2; 95% CI: −49.4 to −16.1, P < 0.05). However, these studies lacked control groups. Cohorts with moderate anemia at baseline showed insignificant changes in LVMi: 5.3 g/m2 (95% CI: −0.8 to 11.3) for patients assigned to a lower target, and −6.6 g/m2 (95% CI: −17.2 to 4.0) for patients assigned to a higher target (Hb > 12 g/dl or Hct > 36%). The effect size was similar in direction for both CKD and ESRD cohorts. Conclusions: Aggregated results from multiple studies suggest that in severe anemia conventional Hb targets for EPO therapy are associated with a reduction in LVMi, but that in moderate anemia target Hb above 12 g/dl does not have a significant beneficial impact on LVMi compared with conventional targets. Compared with the general population, the annual cardiovascular death rate in dialysis patients is higher for all age groups, particularly for the young, whose mortality is up to 100 times greater (1). Chronic kidney disease (CKD) is associated with a substantially increased incidence of congestive heart failure and of atherosclerotic vascular disease events in both diabetic and nondiabetic patients (2). In dialysis patients, cardiomyopathy predisposes to heart failure and to earlier death (3). A reduction in left ventricular mass index (LVMi) has been linked with an increase in both all-cause and cardiovascular survival (4), and progression of cardiomyopathy has been associated with the development of de novo heart failure (5). Anemia is an independent predictor for heart failure in dialysis patients (6), in renal transplant recipients (7), and in CKD patients (8). It is associated with the development of echocardiographic left ventricular hypertrophy (LVH) in predialysis CKD patients (9) and in dialysis patients (10), and with electrocardiographic LVH in transplant recipients (11). Recombinant human erythropoietin (EPO) is indicated for the treatment of anemia in patients with CKD and end stage renal disease (ESRD). Numerous studies, including many randomized controlled trials (RCTs), have demonstrated that treating anemia related to kidney disease with EPO increases hemoglobin/hematocrit (Hb/Hct) levels, reduces transfusion requirements, and improves the quality of life (QOL) (12–14). Other RCTs in which a normal hemoglobin target was compared with partial correction of anemia with EPO suggested that higher hemoglobin targets may be harmful. Clinical events related to higher hemoglobin targets in some trials have included higher vascular access thrombosis (15), higher BP or greater requirements for antihypertensives (16,17), cerebrovascular events (17), cardiovascular events (15,18), earlier need for renal replacement therapy (19), and higher mortality (15,18). In recent years, RCTs have been undertaken to determine the optimal target hemoglobin level for EPO therapy using changes in cardiac structure as a primary or secondary outcome, on the assumption that this outcome is a surrogate for subsequent cardiac events (4,5). An attractive hypothesis is that treatment of anemia with EPO will decrease or prevent LVH, and subsequently prevent cardiac events associated with LVH. The purpose of this study was to evaluate the impact of EPO therapy on changes in the LVMi among anemic CKD and ESRD patients receiving recombinant human erythropoietin, and to evaluate whether target Hb is a determinant of the LVMi effect size. Using the PubMed database, we performed a systematic review of the medical literature published between January 1990 and February 2007 to identify studies relating EPO treatment and cardiac outcomes. The initial search was performed using the following keywords: “EPO or rHuEPO or erythropoietin,” “cardiac or cardio or heart,” and “CKD or renal or dialysis.” An additional search for abstracts from relevant conference meetings, such as the American Society of Nephrology and the European Dialysis and Transplant Association, was also conducted. Results of the search were initially analyzed in title and abstract format. Reference sections from selected publications were then checked for additional articles or abstracts. Further investigation of full-text versions of eligible publications revealed that LVMi was the most consistently reported cardiac outcome in the literature, leading to the choice of change in LVMi as the primary endpoint of interest for this study. On the basis of this information, we revised our search to include the additional keywords “epoetin” and “left ventricular hypertrophy” and included all studies that reported LVMi values before and after EPO treatment for anemia in CKD or ESRD patients. All of the selected articles were published in peer-reviewed journals. Only one eligible abstract was excluded from this analysis because the results presented therein had not subsequently been published in a peer-reviewed publication outlet. Two reviewers (M.L. and D.L.V.) independently applied the inclusion criteria and assessed the quality of the data collected. Each reviewer evaluated the relevant data from the eligible studies and entered the information electronically into an Excel data collection form with prepared fields. If relevant data were reported only graphically, values were estimated by physically measuring the charts with a ruler. Quality control was done by comparing the two independent datasets. Any differences were reconciled by a third party, referring to the original sources. Data on the study design, patient characteristics, and outcomes were collected for each selected study. These include, but are not limited to, the number of subjects; study duration; dose schedule and titration; target Hb/Hct; as well as baseline and final values for Hb/Hct, weight, BP, body surface area and LVMi. Severe anemia was defined as mean baseline Hb <10 g/dl; moderate anemia, as mean baseline Hb ≥10 g/dl <12 g/dl. The lower target Hb was Hb ≤12 g/dl or Hct ≤36%; higher target Hb was Hb >12 g/dl or Hct >36%. Note that the definition of lower target Hb coincides with the current recommended guidelines for the treatment of anemia in CKD as established by the National Kidney Foundation. These guidelines suggest a target Hb in the range of 11 to 12 g/dl in most patients (20). For each study cohort treated with EPO, the change in LVMi was calculated as the difference between the baseline and final LVMi values. When LVMi measurements were reported at several points in time, the last available data point was used to determine the effect size. Pooled effect sizes (or changes in LVMi) and 95% confidence intervals (CI), stratified by baseline Hb level and target Hb, were calculated and plotted for each cohort using traditional meta-analysis techniques. To further investigate the characteristics that could influence the impact of EPO on LVMi, we also pooled estimates generated for the set of all cohorts, stratified by baseline Hb, target Hb/Hct, and stage of kidney disease (CKD versus ESRD). The stratified pooled estimates were computed using either a fixed-effects model—in the event that the between-study variance was small and a statistical test confirmed that the studies were sufficiently homogeneous—or a random-effects model, otherwise. To generate a fixed-effects estimate, the effect size of each study is weighted according to the inverse of its variance. For a random-effects estimate, it is assumed that there is variability between studies in addition to variability within studies. Therefore, each effect size is weighted according to the sum of between- and own-study variance. A two-sided alpha error of 0.05 was used to determine statistical significance. Figure 1 summarizes the search strategy that was used. The initial search yielded 635 research publications, of which 598 were excluded for the following reasons: anemia not treated with EPO, primary outcome not cardiac related, or patients without kidney disease involved (n = 258); studies presented a review of existing literature, meta-analysis, letter to the editor, editorial, or practice guidelines (n = 254); studies were published before 1990 or evaluated nonhuman subjects (n = 68); and other reasons including, but not limited to, same study population used in one of the selected articles, cross-over design used, and study not published in English (n = 18). An additional 22 publications were excluded because they did not report baseline and final LVMi values. Flowchart showing how studies were selected. A total of 15 unique studies with nonoverlapping patient populations and involving 1731 CKD and ESRD patients treated with EPO were selected for inclusion in this analysis. Table 1 describes the study characteristics, including change in LVMi, for each of the 23 treated cohorts in these 15 studies (4,16–17,21–32). Five of the studies assigned cohorts using a randomized study design (16–17,28,30,33), and six compared the LVMi outcomes of patients assigned to a lower Hb/Hct target level to those of patients assigned to a higher Hb/Hct target level. None of the studies compared the outcomes of treated patients to a randomly assigned, untreated control group. The treatment period for these studies ranged from 4 mo to 4.4 yr, with a mean duration of 16 mo. Patient cohorts varied considerably with respect to several dimensions at baseline (Table 1). Sample sizes ranged from 7 to 300 patients. In eight of the 23 cohorts, patients were assigned to a higher Hb/Hct target, defined as Hb > 12 g/dl or Hct > 36%. The remaining 15 cohorts were assigned to a lower Hb/Hct target (Hb ≤ 12 g/dl or Hct ≤ 36%). A majority of the cohorts (14 out of 23) comprised only dialysis patients. In the remaining nine, six contained a mix of predialysis and dialysis patients, and the rest were composed entirely of predialysis patients. Of note, mean LVMi at baseline was within the normal range (< 125 g/m2) in just one of nine cohorts with severe anemia and in eight of 14 cohorts with moderate anemia (34). More than half of the total patients evaluated were being treated for hypertension. Figure 2, which provides a graphical representation of the data points and 95% CIs used to generate the pooled estimates, reveals that several study cohorts experienced reductions in LVMi that were considerably larger than the overall pooled value of −9.2 g/m2 (all studies; Table 2), whereas several others experienced much smaller, even positive, changes in LVMi. In this Figure, the 23 study cohorts were stratified according to severity of anemia at baseline (mean Hb < 10 g/dl versus mean Hb ≥ 10 g/dl) and target Hb for EPO therapy (lower versus higher). (a) Study cohorts with severe anemia at baseline and lower target Hb. (b) Study cohorts with moderate anemia at baseline and lower target Hb. (c) Study cohorts with moderate anemia at baseline and higher target Hb. Table 2 presents the pooled LVMi effect size for various subsets of the 23 treated cohorts that were identified in the 15 selected studies. The stratified analysis reveals that the estimated effect size for the pooled cohorts with severe anemia at baseline, all of whom were assigned to a lower target, was −32.7 g/m2 (95% CI: −49.4 to −16.1, P < 0.05; Figure 2a). Likewise, among the cohorts with moderate anemia at baseline, the estimated effect size ranged from 5.3 (95% CI: −0.8 to 11.3; Figure 2b) for lower target cohorts to −6.6 (95% CI: −17.2 to 4.0; Figure 2c) for higher target cohorts. The estimated change in LVMi was not significantly different from zero for either group of pooled cohorts with moderate anemia at baseline. The two studies showing a significant reduction in LVMI with increase in Hb levels did not have a control group (Figure 2c) (31,32), and one of them included co-intervention with optimized heart failure therapy (32). Among cohorts with severe anemia at baseline, LVMI outcomes may have been influenced by a decrease in systolic BP during the studies, as final systolic BP was significantly lower than baseline (-9.6mmHg; 95% CI: −17.6 to −1.66, P < 0.05; Table 3). The estimated BP effect size among cohorts with moderate anemia at baseline was not significantly different from zero, irrespective of target Hb. Once cohorts were further stratified by stage of kidney disease, the number of observed data points that contribute to each pooled estimate was small. Four of the six resulting cohort subsets rely on three or fewer cohorts each to generate a pooled estimate (Table 2). Under these conditions, traditional meta-analysis techniques do not contribute a lot beyond what can be plainly observed by looking at individual data points. Nevertheless, one can observe that among the cohorts with moderate anemia at baseline, dialysis patients (as represented by eight cohorts) were no more likely to experience an increase in LVMi than predialysis patients (as represented by six cohorts). This study reviewed existing literature to evaluate the impact of EPO therapy in anemic CKD and ESRD patients on LVMi and investigate the determinants of the effect size across study cohorts. The results suggest that patients with severe anemia had a substantial improvement in LVMi when assigned to a target Hb ≤12 g/dl, whereas those with moderate anemia had no improvement in LVMi, irrespective of target Hb. Reductions in LVMi are considered to be a surrogate marker of improvement in the cardiovascular health of ESRD patients (4,5). The large difference in observed outcomes between groups with severe versus moderate anemia may be attributable to the corresponding state of cardiovascular health at baseline. On the basis of reported LVMi values at baseline, 89% (8/9) of the cohorts with severe anemia at baseline reported having a corresponding LVMi ≥125 g/m2, in contrast to just 43% (6/14) of the cohorts with moderate anemia at baseline. The potential for change in the group with severe anemia at baseline is considerably greater relative to patients in the group with moderate anemia at baseline, many of whom had LVMi values in the normal range and would therefore be unlikely to experience any significant reduction in LVMi as a result of EPO therapy. The results for both the severe and moderate anemia groups can be interpreted as beneficial to the heart. On the one hand, EPO therapy is linked with a significant reduction in LVMi among those with severe anemia at baseline, especially among patients with ESRD. However, this result must be tempered by the fact that no control group without EPO therapy was studied, and the potential for regression to the mean of the echocardiographic measurements was not assessed. On the other hand, EPO therapy is linked with maintaining LVMi among those with moderate anemia, which was likely to have kept a majority of patients within the normal range for LVMi. One exception applies to four cohorts with moderate anemia who started the study with LVMi above the normal range and who were also assigned to a higher target Hb. When pooled, the estimated change in LVMi for those four cohorts is negative and significant (-17.9; 95% CI: −35.0 to −0.8, P < 0.05). Although reduction in LVMi was not otherwise observed across the moderate anemia group, in the absence of any real potential for reducing LVMi, prevention of LVH could be considered the best possible outcome. This interpretation must be tempered by the fact that again no control group with moderate anemia was left untreated. Observed outcomes varied considerably across studies in which cohorts with moderate anemia were assigned to a higher target Hb. Although these differences may be explained by certain study or population characteristics, further investigation may be needed to better understand the relationship between EPO and LVMi. In the largest study reviewed, an RCT of incident hemodialysis patients without symptomatic cardiac disease, whose baseline LVMI levels were normal, patients suffering from moderate anemia were randomly allocated to either lower or higher Hb targets and followed for 2 yr (17). Both cohorts demonstrated an increase in LVMi (Figures 2b and 2c) that was not prevented by EPO therapy. These results are consistent with the belief that hemodialysis is a state of hemodynamic and metabolic perturbation which predisposes to LVH (17,33). In a second large RCT, two cohorts of hemodialysis patients who demonstrated concentric LVH at baseline were assigned to lower and higher Hb target groups, both of which experienced an increase in LVMi (16). By contrast, a cohort of 230 patients in yet a third study were assigned to a higher target Hb and experienced a significant decline in LVMi (32). However patients in this study may have benefited from a treatment method that combined the correction of anemia with optimized heart failure therapy. Regression to the mean may also have occurred, as no control group was studied. This study is subject to several limitations, inherent in the studies reviewed. First, there is potential for the impact of EPO therapy to be confounded by the development of EPO-induced hypertension and prescription of concomitant antihypertensives (16,17). However, it is of interest that in the cohorts with severe anemia at baseline, systolic BP fell during follow-up, which may have contributed to the regression of LV hypertrophy. Second, there is a lack of optimal control groups (i.e., no untreated anemic cohorts). Third, there is variation across studies in terms of study design (cohort versus RCT), patient populations (CKD versus ESRD), and achievement of target Hb levels (27,29). The absence of comparable control groups ensures that cohort studies are weak designs for the evaluation of treatment efficacy. Fourth, the outcome variable of interest in each study was determined on the basis of a formula that has been refined over time. It is possible that more recent studies would evaluate LVMi size more accurately. Fifth, the potential for bias resulting from regression to the mean could result in larger changes in LVMi among patients with low Hb values at baseline (who, in general, have relatively high LVMi values at baseline) simply because patients tend to return to their long-term average LVMi level (35,36). Sixth, the assumption that LV hypertrophy is a surrogate marker for adverse clinical events in CKD has not been confirmed by an RCT in which clinical cardiovascular outcomes after an intervention were mirrored by LV mass outcomes. Finally, we recognize that publication bias has the potential to distort the results of meta-analyses and systematic reviews of literature. Although there exist techniques for identifying the presence of publication bias (e.g., plotting effect size against variance or sample size and checking for symmetry), the most vulnerable studies (i.e., those with small sample sizes and those funded by entities with a financial interest in the results) share traits that could potentially confound the results of such a test. Larger and more negative LVMi effect sizes were observed among cohorts with severe anemia at baseline (Figure 2a). It would be difficult to determine whether the resulting asymmetry between these cohorts and the moderate anemia cohorts is due entirely to differences in baseline Hb or, instead, reflects a degree of publication bias. Despite these limitations, the results of this study support the treatment of severe anemia with EPO. Not only will this therapy prevent blood transfusion and improve quality of life, it is likely to have a beneficial effect on cardiac structure. The results from RCTs do not support higher target Hb levels for EPO therapy as there is no evidence for beneficial effects on cardiac structure. A possible exception is cases in which baseline LVMi levels are already elevated above normal, but the evidence to support this conclusion has arisen from two studies without a control group, one of which included cointervention with both EPO and optimized heart failure therapy. One must remember that RCTs have produced a signal that high target Hb may have negative health outcomes (15–19,37). These adverse outcomes have not been observed uniformly across these studies, and several outcomes have had marginal statistical significance and wide confidence intervals for effect estimates. Current National Kidney Foundation guidelines recommend a target Hb of 11 to 12 g/dl (20), and a large RCT (N = 4000), TREAT, is examining the efficacy of a high-target hemoglobin compared with placebo in type 2 diabetes with CKD (38). This systematic review and meta-analysis revealed that in cohort studies of patients with severe anemia, a significant decrease in LVMi was observed. However, the lack of control groups was a major problem. In RCTs of CKD and ESRD patients with moderate anemia, no difference in cardiac structure was observed in comparisons of patients randomly allocated to lower or higher Hb targets. Dr. Parfrey received no funding from the sponsor and was responsible for interpreting the data and writing the paper. He has received research funding from AMGEN and Ortho-Biotech. Financial support for this study was provided by Janssen-Ortho Inc., Canada, to Groupe d’analyze.